Hi everyone, it is with great shock and sadness that we announce that Yvonne Ruiz has passed away at the young age of 40 years old. 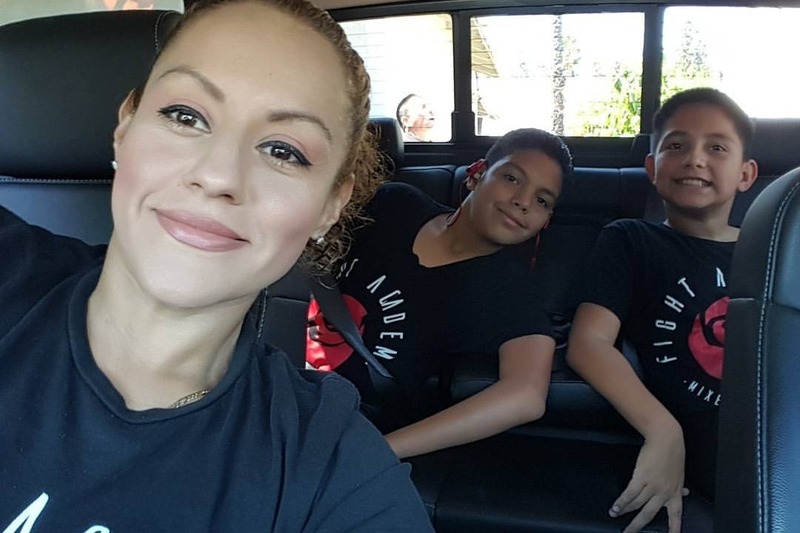 Yvonne was a staple a Fight Academy of Pasadena for over 3 years with her beloved boys Adan and Andy. She not only was a huge supporter of the gym, but she was a beloved mother and friend to all. She carried herself with just enough sassiness to get through tough times. Yvonne was a deep and caring friend to many. There were many times that a tupperware full of dinner would be waiting for my family after a hard day of work, training and renovating our current gym home. Whether it was her enchiladas, some posole or her bomb shrimp ceviche, it all was appreciated. There were always calls and texts when she knew life was getting overwhelming for us. There were times when I could say she was my ride or die, and had my back. Life got tough for her and the boys and she moved with them to Riverside this past summer. We were not in contact as much as we had been. She still made a point to come out for Gio's baby shower and to support in anyway she could. Through Facebook and Instagram, it seemed like she wasn't so far away. Her jokes continued and smile persisted. She was on such a great path to independence and freedom from life's turmoil. I have been in contact with both Adan and Andy, who are devastated. Yvonne was a very involved, supportive Mother. Her boys kept her going and her quest for a better life for her family. Everyone has reached out with questions on a service and how they can help. First, there are still lots of questions regarding her death that must be answered before her service can be planned. Once we have any details, we will share on how we can celebrate Yvonne. Second, you can help. The boys are with their Grandma Gigi who appreciates all of the kind words of love and encouragement. She is pulling any available resources to help her and the boys during this time of grief and transition. If you have funds you are able to contribute, you can donate here. Everything collected will be given to Gigi to use towards a memorial service and to assist with the many costs with transitioning with the boys. If you have resources you can lend, please reach out to me as well. There is a lot to sort out, and as a community, we can help show love to Yvonne, Adan and Adan. We love and will forever miss you my friend. Sending hugs to you. Yvonne's service will be in both Riverside and Pasadena. The viewing will be held on Friday, April 5th from 4-7pm. The rosary will follow from 7-8pm. This will be at Thomas Miller Mortuary at 4933 La Sierra Ave, Riverside, CA 92505. So sorry we have not updated everyone on Yvonne's service yet. The planning is underway and will be announced early next week. The past week and a half has been a roller coaster for the family, especially the boys. Today was another tough day for them. Please continue to pray for Adan and Andy, more than ever. Continue to check in on the boys if you have contact with them. They need to know that there is community that loves and supports them. We believe that prayer has strength in numbers. Thank you to everyone who has showed Yvonne and her boys the love and support. I have received so many texts and messages from her heartbroken friends. This just goes to show how proud we were of Yvonne and all the sacrifices she made to make sure her and her boys were safe and loved. Let's continue to spread the word and raise as much as we can. Thank you so much for all of your generous donations for Yvonne and her boys. I have been in contact with the boys and they are so appreciative. They are asking for you to pray for them, as tomorrow will be challenging day for them to get through.